As we head towards the end of 2018, CALRG aims to finish the year on a high with a month devoted to IET’s Professional and Digital Learning group. November kicked off yesterday with a seminar detailing four projects that the group are involved: how energy companies learn following incidents, strategies employed by finance professionals to learn during times of uncertainty, tensions arising in large-scale changes of higher educational institutes, and the use of social media by medical students as a way of learning. This entry was posted in Uncategorized on November 2, 2018 by Vicky Murphy. As one of the UK’s leading and longest running research groups in this area, we are looking forward to celebrating our 40th year with an event at the Open University on 19th October 2018 at which we will be welcoming back former members and friends. We have planned an exciting day of talks looking back at the group’s history, tracing the trends in our research over the years to help us look forward to the future of learning with computers. Tickets are available on EventBrite. We have sold out of tickets to attend in person, but you can still register for the livestream, and we have had the odd cancellation, so it’s worth a look. We are also working on a book to mark the event – look out for more information! This entry was posted in Uncategorized on October 11, 2018 by Doug Clow. We are excited to announce the start of the new programme for 2018-2019! This year we will be aiming on delivering a mixture of informative updates from around the university, practical workshops, interactive panels, and of course cake. Last year the CALRG team invited a huge range of speakers to spread fresh ideas and approaches to research. The team this year aims to continue and build on that theme, with a focus on varying the format of the weekly sessions. This entry was posted in Uncategorized on October 4, 2018 by Vicky Murphy. CALRG2018 conference programme and keynotes now available! In preparation for the upcoming CALRG 2018 conference, the PDF of the conference programme and proceedings and details of the keynote speakers are now available. Full details of the conference can be found on the official conference website. Please direct any queries regarding the conference to calrg@open.ac.uk. This entry was posted in Uncategorized on June 10, 2018 by Vicky Murphy. We are delighted to announce this year’s Call for Papers for the OU’s annual CALRG conference. The 39th Annual Conference of the Computers and Learning Research Group (CALRG) will be held on 18th-19th June 2018 in the Open University’s Jennie Lee Building, Milton Keynes, UK. CALRG is one of the UK‘s leading research groups in the use of technologies in education. 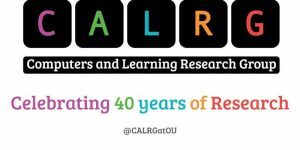 CALRG’s annual conference provides a forum for members, as well as other researchers and practitioners at the OU, to present their work. We particularly encourage research students to contribute submissions and attend to discuss their project. For full information, see the Call for Papers. The deadline for submitting to the conference is now midnight on Friday 11th May 2018. All submissions should be made through the Easychair website. CALRG 2017-2018 academic year starts soon! We are changing things slightly so that our second Thursdays will now be about ‘Communicating research’ more broadly (rather than just a reading/discussion group). Our third Thursdays will now focus on ‘sharing engaged research’, talking about our own research experiences and giving advice about how engagement with various stakeholders happens before, during and after the research process. We will also be hearing from some fantastic external and internal speakers on the first Thursday of every month, and enjoying a chance for a hot drink and catch-up over FREE CAKE on the fourth Thursday of every month. CALRG2017 conference programme and keynotes now available! The full CALRG2017 conference programme and details of keynote speakers are now available. Please see the main conference page for details of the programme and keynote abstracts and biographies. For the first time this year, we are asking people to register if they are intending to come along, so we will have an idea of numbers, particularly for catering. For Weds/Thurs, there is a registration form. For the Friday (FLAN day), you will need to email Michelle Stannard directly. See the conference page for full details and hope to see lots of you there! The 38th annual CALRG conference will be held on the 14th – 16th June 2017 in the Open University’s Jennie Lee Building. 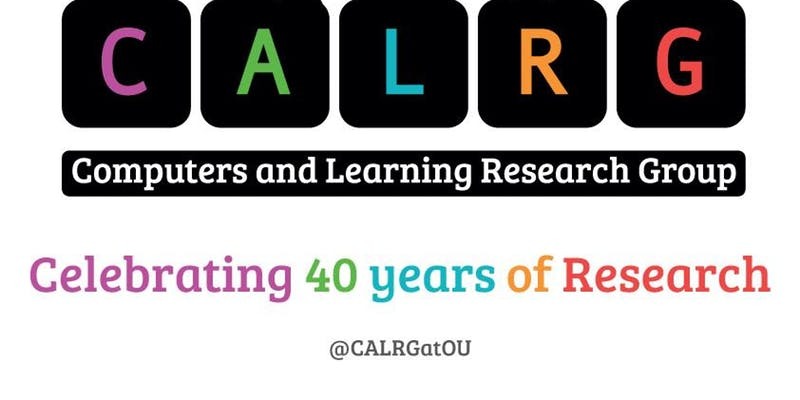 CALRG’s annual conference provides a forum for CALRG members, including staff and research students at the Open University, to present and discuss their research and projects. This year, the third and final day of the conference will be a FutureLearn Academic Network (FLAN) Day, focussing on MOOCs and research resulting from the FutureLearn platform. More information about the FLAN day and how to present at it will be distributed by Tuesday 4th April 2017. For more information, see the Call for Papers. The deadline for submitting to the conference is now midnight on Friday 7th April. All submissions should be made through the Easychair website. For the first event of the year will feature Regius Professor of Open Education Eileen Scanlon. The event will be talking about CALRG, its history and where it is going. This entry was posted in Uncategorized on October 5, 2016 by Garron Hillaire. CALRG invites submissions for its 37th annual conference, to be held on 6-8 June 2016 in the Open University’s Jennie Lee Building. This year, the first day of the conference, 6th June, will be a FutureLearn Academic Network (FLAN) Day, with the main conference being held on 7/8 June, consisting of academic presentations and posters. Please see the ‘Conference’ tab for our Call for Papers and more information about attending the conference. This entry was posted in Uncategorized on February 25, 2016 by Jenna Mittelmeier.